Orbital ATK manufactures the twin five-segment solid rocket motors that will help boost NASA's new heavy-lift Space Launch System (SLS) out of Earth's gravity. On March 11, a major milestone will be reached with a static test of the motor, Qualification Motor-1 (QM-1), at Orbital ATK's T-97 test stand in Promontory, Utah. Engineers, operators, inspectors and program managers across Orbital ATK's Flight Systems Group have spent months getting ready for this milestone event, which will move America's space program one step closer toward deep space exploration missions. 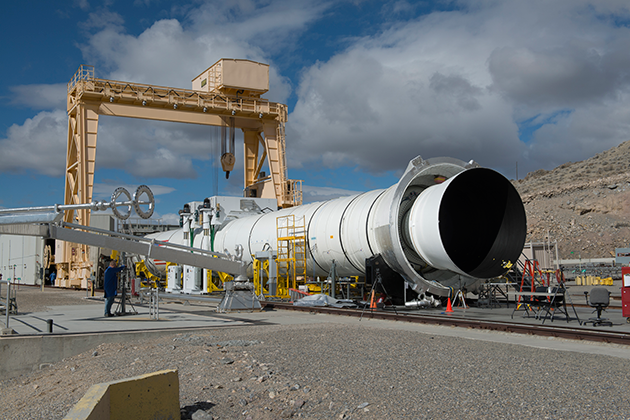 Orbital ATK's five segment rocket motor is assembled in its Promontory, Utah test stand where it is being conditioned for the March 11 ground test. In preparation for the test, the Marshall Space Flight Center (MSFC) Test Readiness Review (TRR) was successfully held Feb. 10-11 at MSFC in Huntsville, Alabama. Pending satisfactory completion of normal operations flow and open items identified from this review, the SLS booster test hardware will be ready to support the March 11 QM-1 static firing. "The crew officially starts daily countdown test runs of the systems this week, at T-15 days," said Kevin Rees, director, Test & Research Operations at Orbital ATK. "These checks, along with other test stand calibrations, will verify all systems are ready for the static test. Our team is prepared and we are proud to play such a significant role on this program." The qualification motor is nearing completion of its build-up in the T-97 test stand. All five segments of the solid rocket booster have been meticulously cleaned, insulated, cast full of propellant and stacked horizontally on the test stand. Team members have spent months planning to ensure everything is in place and ready to go for the test. Instrumentation gages and sensors are being connected, tested and verified to assure that as much test data as possible is captured. Prior to the test, QM-1 is housed in a large, movable structure that has its own steam plant to provide heat to the building. The current temperature in this facility is 100 degrees F, and the QM-1 booster is being conditioned daily in order to reach a propellant mean bulk temperature of 90 (+/- 5) degrees F. Maintaining strict temperature control is essential because the QM-1 test is designed to qualify the booster's performance at the highest end of its accepted temperature range. For the test itself, more than 500 instrumentation channels will be used to help evaluate more than 100 defined test objectives. In addition to the recorded data, an extensive post-fire disassembly inspection will be conducted, allowing engineers to further analyze booster component performance. Many space enthusiasts will make the trip to Promontory, Utah, to witness this first qualification test of the SLS solid rocket motor. Public and VIP viewing areas are being set up and all involved are anxiously awaiting not only test day, but also looking forward to the first launch of the entire SLS vehicle in just a few years.